There was some big Honus Wagner news (although not very surprising) this week. 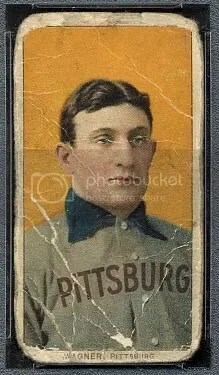 Bill Mastro admitted that he trimmed the infamous T206 Honus Wagner tobacco card he purchased for $25,000 in 1985. Its no surprise to most collectors. Everyone that has owned that card has made money on it, except for Ken Kendrick who is the card’s current owner and owner of the Arizona Diamondbacks. Mr. Kendrick might have a difficult time making a profit after Mastro’s little announcement. That’s if he ever decides to sell the card which he purchased for $2.8 million back in 2007. If you don’t have the cash for a 1909-11 T206 Honus Wagner, you could always settle for one of his many other collectibles ,like this pin. 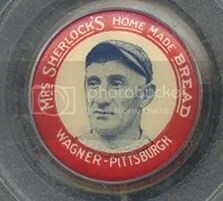 The 1924 Mrs. Sherlock’s Home Made Bread set consists of 10 pins – Grover Alexander, Ty Cobb, Rogers Hornsby, Walter Johnson, Rabbit Maranville, Paddy Moran, Babe Ruth, George Sisler, Tris Speaker, and Honus Wagner. These were offered as a premium for people that purchased Mrs. Sherlock’s Home Made Bread. Pins from this era are highly collectible. The Wagner can sell for $100.00 to over a $1,000 depending on its condition. Have You Seen This Audi Commercial? I saw this commercial for the first time last night and thought it was funny. I’m going to make a very bold prediction. 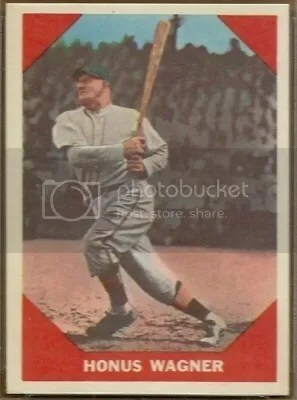 Someday one of the major card manufacturers will purchase a very valuable vintage card, cut it up, and insert various pieces into newer cards. The signs have been there all along and it sure wouldn’t surprise me one bit. Starting with products like TRISTAR Signa Cuts and slowly moving into more popular products like Upper Deck SP Legendary Cuts, its not uncommon to find older cards cut up and reinserted into circulation. I don’t like the idea of a company cutting up any type of card, even if its only worth one penny. I really don’t like it when they destroy modern day cards like Topps does with their Pro Debut product. There is absolutely no reason to cut up a perfectly good AFLAC autograph. Just insert the whole card. It would save a lot of time and money. Hell, I’d settle for a redemption for the entire AFLAC autograph instead of this half breed of a card. I can’t believe Topps is doing this for a second year in a row. Why don’t they just get it over with. 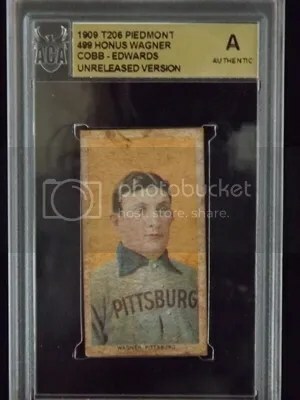 The next time a T206 Honus Wagner shows up for auction, buy it, and cut it up. When does a card become more than just a card? When does it become a relic worth cutting up? 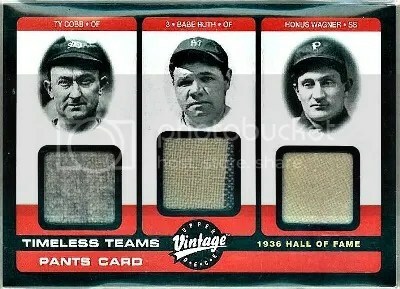 What do you think the value of a T206 Honus Wagner relic would be?